(CNN) -- South African Rory Sabbatini shot a season-low of six-under 64 to claim a share of the halfway lead alongside American John Mallinger in the Byron Nelson Championship at TPC Four Seasonstive on Friday. 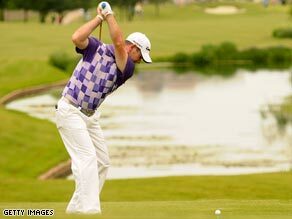 South African Sabbatini shot a season-low round of six-under-par 64 to claim a share of the halfway lead. But defending champion Adam Scott missed the cut by three strokes after a second consecutive round of 71. Sabbatini sank seven birdies, including four in a row on the front nine, against just one bogey to move onto eight-under-par overall -- one shot clear of a group of five. "My par on No. 3 was better than any of the birdies," Sabbatini said. "I drove it in the water, then hit a 5-iron in the right greenside bunker, then holed it. Just a regulation par." Mallinger, who tied for third at The Players Championship earlier this month to match a career-best finish, eagled both par fives and picked up four birdies, including a 15 foot putt at the 18th to earn a share of the lead. His second round of five-under 65 also included three bogeys. PGA Tour rookie James Nitties, Scott's fellow Australian and first round co-leader, is among those tied for third at seven-under after shooting a 68. The clutch also includes Brian Davis (65) with his sixth consecutive round in the 60s, Briny Baird (64), James Driscoll (66), who finished with back-to-back bogeys, and Dustin Johnson (65). Ken Duke, who shared the first round lead, shot a 69 and sits two back alongside Robert Allenby (67) and DA Points (66).